Space War is an endless, side scrolling, space ship shooter created in Unity 5 for mobile devices (specifically Android). The objective of the game is to shoot as many ships as possible while staying alive to increase your over score. High scores are saved depending on whether you beat your previous one. Touch controls are used to move the ship with multi-touch being used to fire either the standard gun or the powered up bombs. Tapping in the top left will move the ship up while the bottom left will move it down. Each of the different types of ships have different types of AI combined with raycasting, player positioning and pseudo-random parameters. The orange ships would fly into the scene and after a short amount of time they target the player and fly towards them to destroy them. 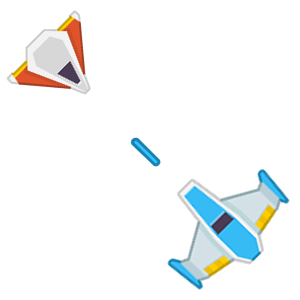 Blue ships operate in a similar way however they shoot at the player instead. All the ships that move up and down (blue, orange, green) raycast to detect the distance between the ship itself and the objects around it, thus allowing each ship to move independently in space.